Are you worried about investing because of the potential risks? Think debt should always come before your savings? Many of these money rules are nothing more than myths. The financial rules you’ve been following for years could actually be costing you money. Here are five money “rules” you should break if you want to boost your savings. No one wants to carry debt – after all, owing thousands of dollars can hurt your credit score and your financial health. However, not debt is terrible. In fact, some forms of debt are downright good. The truth is there are two types of debt: good and bad. Bad debt is any debt you owe that you can’t afford to pay back. Think of bad debt as the debt you’re likely to default on. For example, if you’re using credit cards to pay for your basic living expenses and you have no resources to pay down the balance, that’s bad debt. Good debt is an investment that will increase in value or offer you benefits while you’re paying it back. For example, buying a car or a house will increase your assets, grow your equity, and add to your net worth. Student loans, which tend to be low-interest, are also good debt. Carrying good debt can also help you build your credit score, especially if you have no score or are working to repair your credit history. Good debt can, as a result, increase lenders’ willingness to offer you loans and lines of credit. Coupons seem like big money savers, but often they’re nothing more than marketing gimmicks. Every day, coupons encourage consumers to purchase items they don’t need. Coupons encourage you to spend more money than you originally intended. Coupons encourage you to buy products you wouldn’t purchase otherwise. Coupons require a minimum spend. Even with a manufacturer’s coupon, name-brand products often cost more than store-brand alternatives. Coupons often require you to buy multiples or to purchase certain flavors or package sizes, which can lead to waste. While coupons offer you the chance to save a few cents or a few dollars, they can lead you to spend more. And they’re designed to trick you – as Mental Floss¹ writes, stores often raise prices of items before offering a coupon or offer coupons only on pricier products. Skip the coupons and hit the sale section instead. Buying items on sale, and sticking only to the items on your shopping list, will help you spend less. Many people are intimidated by investing. Maybe you’ve been told it’s too complicated or too risky – but these are nothing more than myths. You don’t need $10,000 to invest. You can start with less than $100 and begin earning returns on your small investment. Thanks to smartphone apps and online investment options, you can invest even just a few dollars per day and make a bit of extra money. Look into companies that offer fractional investments so you can start small. Many will let you invest as little as $10 in stocks and funds. Sign up for a mutual fund through a company that specializes in low-cost investments. Build a personalized investment portfolio with a service like Betterment. The investment platform recommends a selection of exchange-traded funds (ETFs) based on your goals and risk tolerance, letting you determine how much you want to spend. 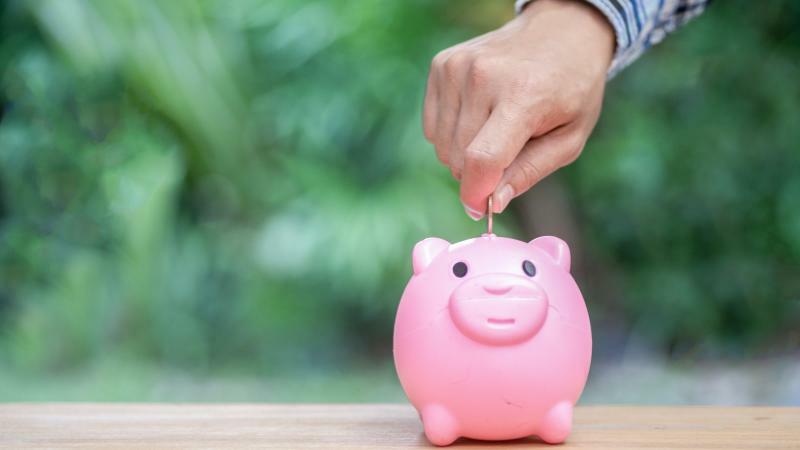 Depositing your savings in the bank is safer than keeping a wad of cash under the mattress, but handing your hard-earned cash over to a big-name bank is one of the worst places to keep your assets for long-term growth. Big banks offer some of the worst interest rates available, and they can charge fees that eat into your savings. You don’t want the money in your savings account to sit and stagnate. If you do so, it’ll losing value every year. Instead, you want to make your savings work for you – so why not switch to an online savings account that offers a higher interest rate and bigger annual earnings? Leave your traditional bank behind and put your savings into an online account. You can choose from a simple savings account or a high-interest savings account. While brick-and-mortar banks like Bank of American and Chase offer interest rates of just 0.01 percent, online banks like Ally and Synchrony offer 1.85 and 1.90 percent respectively, Value Penguin² reports. Paying with cash is a helpful budgeting tool that works for many people, but cash isn’t always the best way to pay. When used responsibly, credit cards can save you money. It’s in your credit card’s perks or rewards that you’ll see savings. Many cards offer cash back on everyday purchases or on purchases in rotating categories. For example, a credit card offering five percent back on every grocery purchase for three months will let you put money back in your pocket. Every time you pay with your card instead of cash, you’ll get a small return – and five percent can add up fast. For every $100 you spend, you’ll get $5. Just make sure you’re paying your credit card balance in full each month so you don’t wind up paying too much in interest, fees, or penalties. Take charge of your money by ignoring popular financial folklore like the myths above. Some of these so-called rules are pointless while others are outright counterproductive. If you’re looking to save more money or increase your income a little bit, take the plunge by purchasing your first stock, switching savings accounts, or getting rid of coupons today. Forgetting the rules helps you increase your net worth while making your wallet a little bit thicker. Interested in increasing your savings? Start a search today.